Reading back over what I wrote about Aston Martin’s DB11 last year (Bay Issue 87 Winter 2017), it would appear that I was a little indifferent to it. Maybe, subconsciously, the colour didn’t help. The launch edition DB11s were a very vivid purple. Or was it the roads I chose? Some were a bit narrow, but then they all are out here in the sticks. And to be honest the DB11 is a bit of a whopper in the metal, bigger even than the DB9 it replaced. In V12 form it’s very much a GT first and foremost; it needs an open, and a preferably wide, road. “Its real raison d’etre”, I wrote, “is to cover big mileages at similarly-sized speeds” before adding “And what a lovely thing it is in which to do such things”. You may have noticed that what we have here, although clearly a DB11, is evidently not a Coupe. 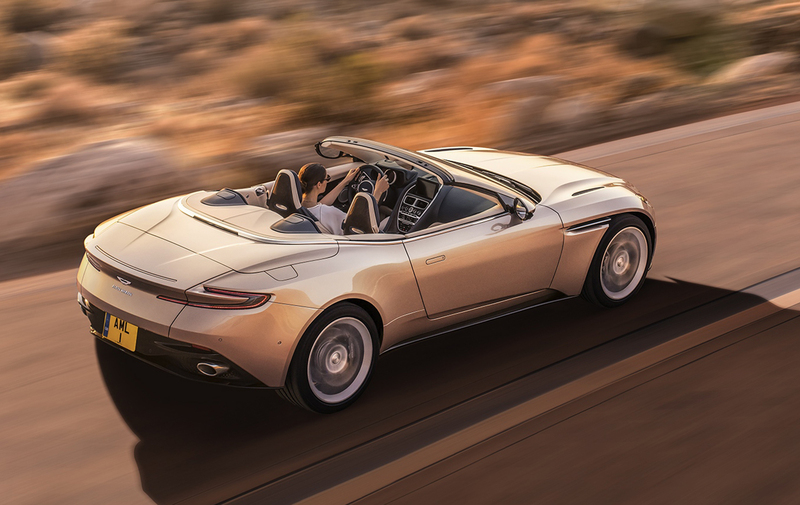 This is what Aston Martin call a Volante: it is very much a soft top. What might not be quite so obvious is that all Aston Martin DB11 Volantes are in fact V8 powered. What that means is – if you just happen to have a spare £159,900 – you can now buy a DB11 that’s slower, heavier, has less rear-seat space – something that unless you’re a toddler was pretty stingey already – less boot-space – that roof has to go somewhere y’know, and… a smaller engine. So why then am I about to tell you that I prefer the Volante? Well, for a start, just look at it. 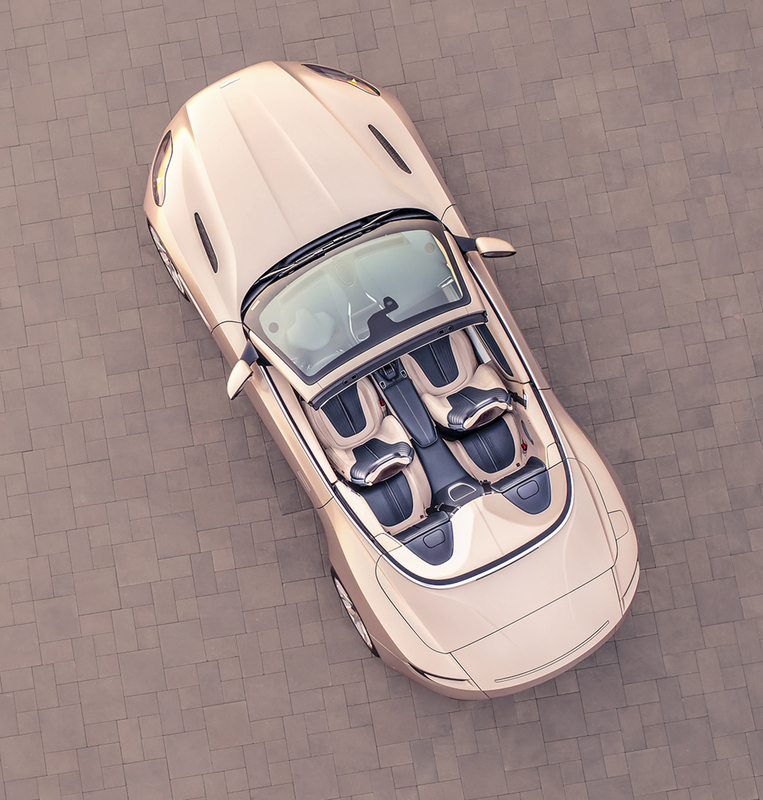 Aston Martin deserve all the credit they can get for making the DB11 Volante look even more elegant – roof up, or down – than the hard-top upon which it’s based. And it’s a proper old-school fabric too. An eight layer K-fold one in fact, complete with flush fitting glass rear window, and available in either red, blue, black, or grey. A folding hard-top apparently, would’ve spoilt the lines. Press the little button on the key-fob, or the one on the centre console, and all that fabric – will fold back in a mere 14 seconds, and at speeds of up to 31mph, before storing itself neatly, discreetly, and near silently, under a metal tonneau behind those tiny rear seats. It’s all very clever. And it also makes for hushed and very cosy, hood-up travelling too. But that’s probably not quite what Aston Martin had in mind. The Volante still yearns for a wide open road, but because it’s got four fewer cylinders it’s got less weight over the front end – or at least that’s how it feels. Apparently Aston Martin added another 110Kg of bracing to stop any soft-top shimmy. Nevertheless in doing so they stiffened the rear subframe bushes in the process, which in turn (pardon the pun) helped sharpen up the steering. As a result you just feel, well, a little more in control somehow. Maybe it’s because when you put the roof down your senses are naturally heightened; you can feel the wind when you accelerate, and you can hear the exhausts all the more – not that there’s any harm in that I hasten to add, Astons always sound lovely. But I swear the Volante feels more alert. I know I said it was slower, but adding 0.1 seconds to the coupe’s 4.0 second 0-62mph time is not something you’re actually likely to notice. Performance feels just effortless, the 8 speed auto ’box finding the right ratio seamlessly time and time-again. Honestly, I preferred driving the Volante to the Coupe. Initial purchase costs aside, fuel consumption in the region of 20 ish mpg – and that’s if you’re careful – means that even if the DB11 looks like a long legged GT you’ll be stopping for fill-ups every 300 miles or so. You’ll need to travel light too, as previously mentioned the Volante’s boot space limits you to little more than a couple of overnight bags. I’ll concede the Mercedes sourced digital instrument cluster is far clearer than Aston’s all but illegible dials of old, but oh boy does it lack their charm. So too do the rectangular and all-too cheap feeling plastic air vents – they simply shouldn’t be in anything costing this much. The seats too are pretty hard, despite their soft brogued leather covering. Class; same sat-nav; same single column stalk for wipers and indicators; same radio and heater controls, … Still, at least everything’s all far more reliable than it once was. So then, the Volante is a car of compromises. It drives superbly, it looks fantastic, and it sounds magnificent. But, it’s got a smaller boot, the rear seats are little more than a token gesture, and if you put the hood down everyone will see those Mercedes instruments, and the awful air vents. Maybe, there’s a solution. Aston Martin’s V8 powered DB11 coupe costs a whole £15,000 less. You get the same engine, you get almost the same looks, you get a bigger boot… And you still get an Aston Martin. Do you really need the wind in your hair as well? Transmission: 8 speed automatic with manual mode, rear wheel drive.